With leading scorer Tim Cahill in action for Australia in the Asian Cup and with injury hitting a number of the Everton forwards, goals could be an issue for them in this match, as it has been all season. Those forwards they do have fit have struggled to hit the net with any regularity, as Jermaine Beckford has had to come to terms with a step up from the Championship and players such as Yakubu and Luis Saha have been in and out of the team, so have not had regular games. That has left Cahill out in front in the leading scorer stakes, with Arteta behind him in second place with three goals tying with Beckford and defender Seamus Coleman, who is another doubt for the match. Without Defoe, Tottenham might have to start with Crouch and hold Pavlyuchenko in reserve in case he is needed later in the game. VDV might start, as he will probably be rested, along with a number of his team-mates in the weekend's FA Cup tie against Charlton Athletic. His partnership with Crouch might pay dividends, but they will need to make Everton's defenders come out of their holding positions into areas they don't want to. With the home side sitting in the bottom half of the table and in need of a win, they will have players sitting deep, with one lone striker and Mikel Arteta trying to get forward to support him. The Toffees best chance of a goal might come from a set-piece with both Arteta and Leighton Baines deadly from a dead ball situation, while they have big defenders, who can cause problems in the air. Conversely, players such as Distin and Fellaini can be found out on the ground. It may be that having Steven Pienaar in the side has a double edge effect for Everton, as he might be out to impress Harry Redknapp as the rumours build about him moving out of Goodison Park and into White Hart Lane and with Fellaini back from suspension, he might be ready to impose himself on the game, but he has got a knack for picking up cards. There might be a rare start for Russian winger Bilyaletdinov, who has pace and a cracking shot. As far as the game is concerned, for Everton, it might not be about scoring goals, but preventing Tottenham scoring, as they successfully achieved that aim at White Hart Lane earlier this season in tying up Rafael van der Vaart and Gareth Bale to seal a 1-1 draw. I expect much of the same here, with Moyes deploying Phil Neville and a midfielder to double up on bale, while Heitinga will no doubt miraculously recover from his injury (much as he did at Spurs) and will stick like glue to Rafa's side. please click here and see if there are any such facilities who have contacted MEHSTG in the area near to the ground. Also, just visit www.supportersaccommodation.com, fill in form and receive 5x10% vouchers for selected places to stay on your travels to away matches. 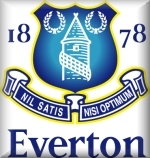 Everton kicked off and played towards the Gwladys Road end in the first half. A tried looking Spurs succumbed to an energetic second half performance by Everton, whose 2-1 win stopped Tottenham closing the gap at the top of the table, while pulled themselves to a mid-table position, close by their struggling neighbours. Harry Redknapp sent out much the same team for the fourth time in a week and a bit and while they were equal to the host in the first period, they looked leg heavy in the second and it was a surprise that the manager did not make use of all three substitutions, but then perhaps he feared an injury and held off using the last reserve. The first couple of minutes was end to end and when the game reached the third minute, the ball was in the end at the Spurs end. With the ball being played into one of Everton's goal-shy strikers - Louis Saha - he was ten yards outside the penalty box and not being closed down when he hit a shot that flew low past Gomes and into the bottom corner of the net to put Everton 1-0 ahead with just minutes gone. It was not the start that Spurs had envisaged. It did prompt a response within a few minutes and when Crouch flocked the ball on to van der Vaart, Rafa hit a first time shot from about 35 yards that had Howard worrying that it might dip into his goal, but the ball went wide and the Toffees goalkeeper escaped that particular chance. That was in the sixth minute and a minute later the roles were reversed, as the Dutchman crossed for Peter Crouch to win a header, but put it just wide of the home goal. However, the partnership came up trumps in the 11th minute to create an equaliser. Luka Modric put Alan Hutton away on the right wing and his cross picked out Crouch at the far post, with his header back across goal perfectly placed for Rafael to run in and meet it with his head to beat Howard to make it 1-1. it was a deserve goal a this stage of the game and set the match up nicely, as it was end to end stuff. Just to prove that, Gomes was required to pull a save out when Modric lost the ball to Marouane Fellaini and the big Belgian hit a low shot that the Spurs keeper had to grab at full length. For the following 15 minutes, both sides had chances as they pushed forward, but the defending prevented any of them being clear cut, so when Gomes elected to punch Arteta's 23rd minute corner out, Saha knocked it to Jermaine Beckford, but his could not keep his shot on target. Then in the 25th minute, Jermaine Jenas produced a timely bock to stop Arteta's ball through to young Coleman ending with a shot on goal. The home team made Gomes work again just after the half hour, when Arteta was once more the architect of an Everton move and his shot came off Modric, but Heurelho dived to hold onto it, even though he had to adjust his position. Modric had a shot that floated away from goal before Coleman made ground on the right wing to cross to make a good chance for Beckford, but the former Leeds man cold only put his header too high from just inside the box. Three minutes before half-time, Rafael almost put Tottenham ahead in spectacular style, as he struck an overhead kick just over the bar after Crouch had once more headed on a neat little dink to him from Michael Dawson. It was a quick piece of thinking by the Dutch midfielder, but was just a little too high. Spurs were pressing to go into the interval ahead, with Crouch having a goal chalked off for offside when Gareth Bale had set him up after picking off a pass from Johnny Heitinga and then in injury time, a long range van der Vaart free-kick nearly caught Howard out and he was pleased to see it go over the bar. Turning around level, Spurs were perhaps looking to come back from a losing position again, in a season where they have done so a number of times, but from the kick off, Everton looked sharper and wanted to be first to the ball. With four minutes gone, Seamus Coleman broke on the right, leaving Assou-Ekotto trailing behind him, but the player chose to ignore the better option of a pull back for Beckford and went for the shot, but Gomes stayed big at his near post and took the shot in his midriff. In the 53rd minute, a cross to Saha saw the Frenchman strike a purposeful volley, but luckily for Spurs the defence got a touch on it to take the sting out of it and divert it wide. Ten minutes into the half, a cynical foul on Bale by Phil Neville took the Welshman down and earned him a booking, but the damage had been done before half-time, with this challenge just finishing the job, as Bale soon left the field looking the worse for wear. van der Vaart was the most likely source of a Tottenham goal and he almost got one, but Howard denied his volley when set up by Crouch's knock down just after the hour, but within a minute, Saha reproduced his volley, from Coleman's cross, with Hutton this time making the vital intervention by getting a touch on it that deflected it wide, when it looked to be heading into the goal. The Everton youngster was in the thick of the action and a few minutes later, Gomes took his cross, but then did his best to hand Everton a goal, when his throw out went straight back to Coleman and his returned effort curled over from outside the box. The pressure was building and perhaps Spurs were fortunate to meet a side who lacked a real deadly striker, was Saha had two chances in quick succession, but put one a yard wide and then hit the second straight at the keeper without a great deal of venom. However, with 72 minutes gone, Spurs almost won it twice over. Firstly, Luka made good ground on the right into the penalty area and pulled the ball into the near post area in the six yard box, where Rafa met it, but had to try and dig it out from under his right foot. He did that and got a decent enough contact on it, but Howard sprawled along his line to make a point blank save to keep the ball out. He had less confidence in his next save, this time from Crouch, who took a pass from Jenas and he ran at the Everton defence, showing some good footwork before hitting a dipping effort that Howard just about managed to get a touch to, being surprised by the striker's drive. The failure to make either of those chances pay cost Spurs. Two minutes later and Beckford did well to play Saha in and his shot from outside the box was well pushed out by Gomes, but Coleman came running in, with Jenas failing to pick up his run and the Everton man headed into the net to make it 2-1. The goal was probably deserved on the balance of second half play, but it goes to show that if you don't take your chances, it can be vital in these sort of games. There were a number of changes with subs coming on at regular intervals which broke up the play and there were few chances, as the game came to an end. Yakubu was sent away on goal, but Dawson managed to get back and see him wide, while Osman had a chance to wrap it up but his shot flew wide of Gomes' goal, eating up a few more vital seconds. When the final whistle went, it was a limp Spurs team that trooped off. Everton had won for the first time at home since the end of October and Spurs had lost for the first time almost the same time. They couldn't keep coming from behind to win and this was one game too far for a number of the players, who will get a rest on Sunday, when Harry will play some of the squad players against Charlton Athletic. It was a chance for Spurs to steal a march on their rivals, but instead they struggled to keep the pace with a more determined Everton side. How this will affect their position in the marathon that is the Premier League season, the next game at home to Manchester United might reveal. It is one of the unwritten laws of football that when there is a chance for Spurs to enter the top three or at least close the gap on them, things will not go to plan. With the other results of the top four teams going our way, except for United's, we could have closed on Arsenal who couldn't get past Manchester City. However, the team looked slower to the ball in the second half and perhaps got what they deserved, as Everton's second goal had been coming for a while. It was a bit galling, as we could have gone 2-1 up ourselves with van der Vaart's shot well saved at point blank range by Howard. Just the matter of a couple of feet and we could have been up there. It is an open Premier League this season, so every point looks more vital than perhaps previously. Therefore, we need to get straight back to the form of our little run through Christmas and pick up a string of points to stave off the challenge from Chelsea.